Hmm... I guess I've been tuning out the weatherfool these past few days... strange that my wife has not mentioned it, she is much more concerned with weather than me. They jerk you around so much I never trust them anyway. it's saying next Tuesday. maybe it will shift away from us. extended forecast says winds at 28mph. thaz windy. I live on the east coast about 60 miles north of of Hatteras and have been following Hurricane Sandy. It is still projected to pass fairly well off shore, so I only expected some high waves and minor coastal flooding. I didn't realize Sandy was expected to combine with another storm which could change the picture to a much worse situation. I still remember the NorEaster that later became 'The Perfect Storm' off New England. We had major flooding and coastal erosion from that one. eeeks. says snow could start Sunday. gale force winds. it's 3 storms colliding. house i'm in is oil heat, hoping that means i'll have heat if the power goes. The furnace still uses electricity for the blower and more likely than not, the igniter. The storm is an unusual mix of a hurricane and a winter storm. I'm pretty sure they mean "FORMERLY unusual". Welcome to climate change. The good news is that if you want a backup generator, a much smaller one will do. Down here in Miami we've had rains and wind gusts all day long that I've heard are from Sandy ....and these are just the outskirts,ya'll up north better batten down the hatches!! I'm gonna stock up on ramen noodles and seltzer water this time; at least I can enjoy those. ...experienced a "noreaster" when I was in Wildwood years ago. The beach (which is huge) was completely swallowed up by the surge and water was menacing the hotel where I was staying at (which had sandbagged the ground floor). Had to stay an extra day as many of the roads leading out of the area were flooded. Last time I heard winds howling like that was in a strong storm that hit the Washington coast with gusts that approached 100mph. Fortunately the storm also closed the Philly airport as well so at least we didn't have to worry about any rebooking fees. The link in today's NY Times eNewsletter was calling it a "Perfect Storm", which means the coming together of two separate storm fronts. I'm getting extra flashlights, batteries and bottled water . . . just in case. Hopefully it won't be as bad as they say, but better to be prepared for the worst. ...cinematic cliche's aside, sounds like it could be the "perfect storm". stuff to tie down in the yard. Using Bryce as a digital elevation model application one can easily turn the recent b/w image from NASA/NOAA into a 3D perspective view. I wish all you folks in its path some good luck and avoidance of this monster. 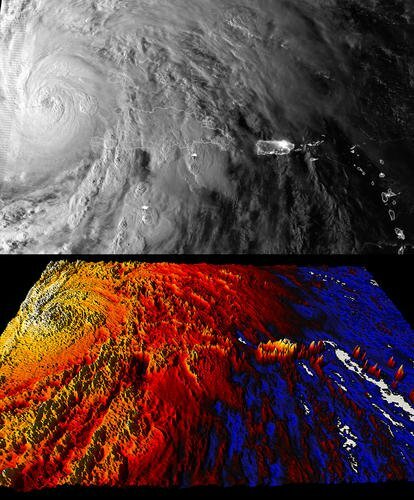 Image credits (top): NASA/NOAA (click for larger view which shows the outline of the coast, islands and surrounds, and how these relate to the bottom render). Edit: Originally posted over on Bryce Discussion's Forum, and thanks to Chohole for directing me here. it looks extra scary from bryce. who is in North Carolina? what's it like by you? Latest I heard was Land fall as a Class 1 Cain from Washington DC to Pen next week. You folks get ready and be safe. Anybody in the Carolinas or Georgia? Is it windy? It is cloudy in Washington, D.C. I think the winds are only 10 MPH. I should do some online shopping before my electricity goes out. One radio station says that Sandy might landfall near Ocean City, Maryland before moving northwest. Jamahoney, thanks for reminding me about hightfield maps. I haven't experimented with using hightfield maps in 3D graphic programs in years. i can't find a weather map where it shows the 2 storms sandy is predicted to collide with and turn into frankenstorm. does it mean that danger is passed? # Sunday A chance of showers. Breezy, with a northeast wind 15 to 20 mph, with gusts as high as 36 mph. Windy, with a northeast wind 28 to 30 mph, with gusts as high as 46 mph. The rain could be heavy at times. High near 61. Very windy, with a east wind 38 to 41 mph, with gusts as high as 60 mph. Very windy, with a east wind 45 to 49 mph, with gusts as high as 70 mph. Chance of precipitation is 90%. New precipitation amounts between a half and three quarters of an inch possible. it's just rude for coastal flooding in the middle of the night. :blank: A relative mentioned this evening the news said landing looks to be around Rehoboth Beach now. To get your 7-day forecast, add your zip code to the green box on NOAA's page & hit "Get Weather", obviously . . . The 7 day forecast says our area may now only get 55-60 mph wind gusts. Still, inland flooding usually causes a good deal of injuries and fatalities. Unfortunatly, no. I'm in Upstate NY myself, finishing battening down and sealing up later on today for this beasty. It's supposed to start hitting us Sunday night and Monday morning (50 mph winds, rain to start) and hit it's peak here around Wed, continuing until Friday in the latest reports. The super storm merger isn't so much two or three major storms merging as seen clearly on a radar. What it more amounts (in my understanding) too it a low pressure system on the west side, with cold air and high moisture will be meeting with the warm, quick moving air on the east side. Typically when a large low pressure and small high pressure meet, it results in a powerful storm, high wind and rain. The problem here is it's a large low pressure system and a very large high pressure system- making the "Superstorm" extremely large in size, and with a wind area that stretches well into Ohio, and a storm with the strength of a hurricane making it's way across land through areas like Penn, NJ, and from the looks of it, most of NY. Not sure how lake effect off the great lakes (Ontario is a monster for lake effect) will play into anything, either- so there there's a lot a variables that can effect it all, and we won't have much concrete till about Wed on how far north and how strong it's going to full hit. Besides flooding, the main concerns are wide area power outages (topping the great ice storm, or Irene, from local reports), millions of downed trees, and heavy damage to the electrical grid / communications. On the west front, snow and ice storms complicate things further. On the east front, storm surge and tidal flux complicates it more. Hopefully something will happen and it'll fizzle, but all in all, it looks..well..nasty. Be well all, be safe, and to those here on the eastern US- ride it out, and see ya on the other side of it all. 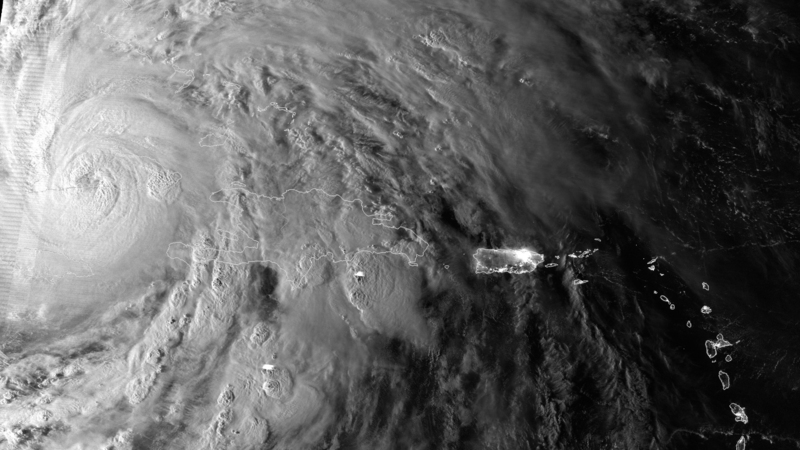 Remember the cinematic cliche is the film of the book* of the original Perfect Storm (which was Hurricane Grace+a nor'easter). * If you haven't read it, do, still one of my top ten all time favourite reads (and Good God that was 21 years ago? Where does the time go!). I'm live near the northern North Carolina coast (on Roanoke Island about 60 miles north of Cape Hatteras) and yes it is very windy. Winds are currently about 50 mph. I work right on the coast at Jennette's Pier in Nags Head and we were supoposed to open today. So, I got up and drove across the the high rise bridge in the high winds (kind-of-scary) to get to work; only to have them decide to close after less than hour. The waves were already breaking as high as the pier deck and the ocean was back against dunes. It would have been too dangerous to let people on the pier. ; but I really did hate geting up early and going to work only to get paid for less than an hour. Local reports indicate that highway 12 to Hatteras has alreadywashed out.